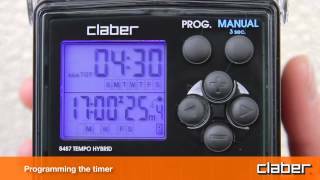 Claber research presents a water timer that is next generation in ecology, versatility and reliability. The integrated photovoltaic panel uses the clean, unlimited energy from the sun, while the 1.5 volt battery inside guarantees sure operation in all weather conditions. Tempo Hybrid is ready for immediate use and allows you to manage irrigation with the utmost versatility and ease. The backlit displays offers optimal legibility and gives you complete control over water timer operation. Tried and tested for reliable, hassle-free operation, it is fitted to connect with the Rain Sensor device, which interrupts the selected program in the event of rain and starts it again automatically when the rain has stopped: also in wireless radio frequency version. One-way automatic timer. Equipped with a built-in photovoltaic panel, this timer is powered by solar energy. Light energy is absorbed even without the panel being exposed directly to sunlight. Indicator of weekly water consumption. Watering times from 5 seconds to 1 minute and 1 minute to 90 minutes. Up to 4 watering cycles per day. Weekly setting, allowing exclusion of single days. Backlit LCD screen ensuring high visibility under all conditions, displaying all functions (setting, time remaining, watering time, rain sensor, battery charge status, RF rain sensor battery charge status). Manual on/off button (variable 15-minute test) Reinforced structure. Bi-material front panel. Transparent protective cover. Electronic components fully insulated, no wires exposed to view. 3/4” tap connector with pivoting ring nut. Washable filter. 1.5V AA alkaline battery guarantees continued operation in the event of prolonged light deficiency. Operating pressure 0.2 - 12 bar. Can be connected to standard Rain Sensor (90915) or to RF Rain Sensor (90831 by way of optional interface). 100% checked and tested. Pieces per pallet: 160 pcs.